Mahavaraha Dāsa – India: The most important fundamental knowledge a devotee needs to advance in Krishna consciousness is based on understanding Srila Prabhupada’s position as sad-guru, the eternal spiritual master, and jagat-guru, spiritual master of the universe. Without this understanding, one’s practice of Krishna consciousness in this age will likely not be very effective. Interestingly, in the statement immediately above, Srila Prabhupada laments not that people in the present times are addicted to sinful life but that they are unable to distinguish between conditioned souls and a liberated soul. Even sinful persons can be immediately delivered from sins and elevated to spiritual life if they accept Srila Prabhupada as guru. Others, however, who are unable to understand the position of Srila Prabhupada and accept instead an imitator as guru, are lost, no matter how moral and upright they may seem to be. In our Gaudiya Sampradaya of Vaisnava acaryas, coming directly from Lord Caitanya Mahaprabhu, many nitya-siddhas have appeared to assist the Lord in His mission. It is said that some of these personalities, like Srila Haridas Thakura and Srila Vasudeva Datta, are equally as merciful as Lord Caitanya Himself. As stated in a song by Srila Narottama Das Thakura and confirmed by Srila Prabhupada, simply by understanding and accepting that such great personalities are nitya-siddha parishads, or eternally liberated associates of the Supreme Lord, Sri Krishna Caitanya, one is promoted to Goloka Vrindaban. Therefore to think Their worship or praise is customary hyperbole that can imitated, or to think ordinary sadhus can equal their level of divinity, is the greatest misfortune that can befall a person in this age. Recently someone sent me a link to a YouTube Video wherein two of maya-iskcon’s most infamous upstarts were speaking for hours, trying to justify their belief that self-appointed or elected iskcon “gurus”, or iskurus, particularly themselves, should be allowed to have their followers worship them in Srila Prabhupada’s temples on a daily basis. They insist that iskuru followers in iskcon should be allowed to install iskuru photos on their so-called vyasasanas and on the altars with the Deities, beside our nitya-siddha parampara. They also defend their self-proclaimed titles, titles that have traditionally been used only for great self-realized acaryas, or maha-bhagavatas. These unauthorized practices of worship were creating so much disturbance in post-1977 Iskcon that most senior devotees, as well as the gbc body, finally rejected them. These two men, however, have always been the most stubborn defenders of their own worship. One of these so-called swamis had blooped from ISKCON in the 1967 or 1968, just after Srila Prabhupada made him a sannyasi. 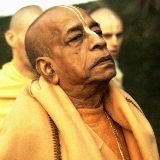 He had become puffed up after becoming ISKCON’s first sannyasi and was apparently unable to tolerate Srila Prabhupada’s supreme position as Founder-Acarya of ISKCON. He then tried to create his own cult, but failed, and later came back to Srila Prabhupada’s mission. He was quite perturbed later on, in 1976, when Srila Prabhupada corrected him after he had tried to post himself as “Founder-Acarya” of Srila Prabhupada’s original farm community. Srila Prabhupada said that He alone was the Founder-Acarya of this community, and He told this man to remove this title from his name in the community journal. In this video this same upstart suggests he would surpass Srila Prabhupada in his volume of devotional service. 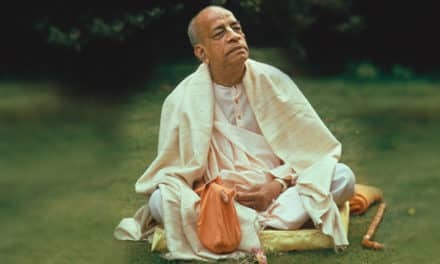 He flatly stated that anyone who disagreed with his receiving public worship in Srila Prabhupada’s temples was an envious person who did not follow the four regulative principles or understand the siddhanta of guru-tattva. Shortly after the production of this video, this same man blooped again from iskcon, after receiving a blow to the head from an irate devotee and suffering severe brain hemorrhaging. Although he had left the mission in the early days with only two or three friends, this time he took with him hundreds of Srila Prabhupada’s disciples. He then immediately began changing the temple sadhana, eliminating Sanskrit chanting, and he introduced a new dress code, following the style of Christian monks. Shortly thereafter, this deranged man got caught in a sexual act with a boy, even while many of his followers were just outside singing his “glories”. This episode was widely advertised all over the world. I heard the story from one of his most trusted, longtime supporters. After this humiliating incident, most of the leaders under him, as well as most of his rank and file followers, rejected him as their leader. He then went into self-imposed exile in disgrace. Similarly, the obese man in this video was attacked by an angry devotee and had his throat cut. He barely held on to his life and his ability to speak– yet he kept on spouting nonsense. He was later caught getting a “massage” from a young female admirer. Recently he lapsed into a coma after a severe heart attack, which doctors say was due to his constantly gorging himself on rich food. This man was so restless that he spent a fortune every year to fly around the planet by first-class airfare while the cows at his farm projects starved due to neglect. It was reported by a credible source that several cows from one of his farms had been sold for slaughter. He generally used to fly alone and would sometimes go missing for days. Now he travels with an entourage of caretakers and body guards. It is said by those close to him that he rarely chants japa, although he used to often claim to chant on a “clicker” while traveling. Both of these pretender iskurus have had devotees, including dhama-vasis, beaten, driven out or even killed for disagreeing with their public worship in Srila Prabhupada’s temples. Although in this video these two men cite scriptural evidence to substantiate that the bona fide spiritual master should be worshiped on the same level as the Supreme Person, Lord Hari, they offer no explanation how they became bona fide spiritual masters without authorization or self-realization. They fail to explain why Srila Prabhupada should be considered dead and gone (posthumous) and no longer the spiritual master and acarya for all Hare Krishna Vaisnava devotees. They fail to offer any explanation why a third-class sadhaka with a material body should be accepted as the spiritual master by new devotees whereas a nitya-siddha shaktavesa with a fully transcendental body should be barred from that post. Finally, they fail to explain why they defy Srila Prabhupada’s written order to offer formal initiations to new students on His behalf– by acting as His ritviks, or deputies. 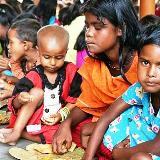 They claim to offer the services of their so-called disciples to Lord Krishna directly. They say this is their own specific service. Yet they fail to explain how they are able to offer things to Krishna directly without bhagavan realization and without first offering everything, including their followers, to Srila Prabhupada. They fail to explain why their followers are barred from approaching Srila Prabhupada directly, although self-appointed iskurus are able to offer everything to Srila Prabhupada and Lord Krishna directly. Using scriptural mandates calling for offering everything to the bona fide spiritual master, they try to justify their bulging personal bank accounts derived from dakshina, or personal donations, and their acceptance of elaborate man-worship in front of the Deities and Srila Prabhupada’s vyasasana. Such man-worship, or the so-called guru-puja of ordinary preachers, is explicitly forbidden by the sastras, especially when done before the Deity or in the temple. Indeed, it is recommended that even advanced devotees not accept any disciples or such worship. This is the version of sastras. For this reason public worship was not generally accepted by previous acaryas in our Gaudiya Sampradaya. Gaudiya Vaisnava gurus have almost always remained as humble babajis, the topmost emblems of renunciation and Vaisnava humility. Such acaryas, like Srila Rupa Goswami, are the real examples for all devotees to follow, as far as possible. This is why the devotees in our Gaudiya Sampradaya are still known as Rupanugas. Srila Bhaktisiddhanta Himself, however, like Srila Rupa Goswami, was the very emblem of Vaisnava humility, and although He is the greatest leader of all Vaisnavas, He accepted formal guru-puja in public only once a year on His divine appearance day, but even then not in front of the Deity in the temple. These two great acaryas are the topmost important spiritual masters in history. No other genuine teacher of Krishna consciousness will imitate their positions as “Prabhupada” or the topmost master of all Vaisnavas. Thus it is hard to find any history of a predecessor acarya of Krishna consciousness accepting regular guru-puja in the temple of the Supreme Lord, even though there is sastric evidence to support this practice in the case of maha-bhagavatas. Falsely citing sastra, but not guru or sadhu, one of the men in this video suggests the absence of daily guru-pujas in Gauidya Math temples was a bogus oversight. What this foolish pretender didn’t realize is that all devotional traditions established by Srila Rupa Goswami were followed precisely by Srila Bhaktisiddhanta Sarasvati in His Gaudiya Math temples. Yet the upstart in this video has the audacity to suggest that the Gaudiya tradition of low-key guru-vandana established by our nitya-siddha param gurus is a tradition of negligence that should be ignored in iskcon by iskurus and their followers. He suggests it is better that modern-day elected iskurus should instead imitate Srila Prabhupada’s unique standard of guru-puja. This ignorant man, now dead, never realized that all bona fide devotees and pujaris from the time of Srila Rupa Gosvami already worship the true guru-parampara daily while worshiping the Deity. Furthermore, all ISKCON devotees are supposed to worship Srila Prabhupada both during mangala aroti and again during the daily guru-puja ceremony in front of Prabhupada’s vyasasana. Iskuru worship is thus an unnecessary and offensive concoction. After fulfilling the predictions of Lord Chaitanya, Lord NItyananda and great acaryas like Bhaktivinoda Thakura, and after proving by His activities and symptoms that He was the great personality predicted by Lord Nityananda, Bhaktivinoda Thakura and Srila Bhaktisiddhanta Sarasvati, Srila Prabhupada allowed devotees to begin formal worship of Him on His personal vyasasana in the temples beginning in 1971. Some devotees had requested him to allow this. In truth, his acceptance of this request was due to His causeless mercy and the direct order of Sri Guru and Sri Gauranga. I still remember the day we started this practice in Miami ISKCON. That was the first day I felt a real connection to Srila Prabhupada personally. (I had not yet met Him but had been chanting and reading for months.) Although I was at first doubtful when I heard about the new program, I felt immediate reciprocation from Srila Prabhupada after singing His prayers and offering a flower and dandavats before His vyasasana. His physical presence was not required. Just before I first saw Srila Prabhupada in the New York airport in 1972, I expected to attain immediate brahman realization because I assumed that seeing Prabhupada personally would be far more potent than worshiping his picture. But the crowds of devotees, reporters and onlookers created a distraction for me. After this, I preferred to worship Srila Prabhupada with only a few sincere devotees in our sankirtana bus or small preaching center. In other words, Srila Prabhupada does not rely on His physical presence to accept disciples or their worship. The topmost pure devotee is not limited in any way. Unfortunately, the two iskurus speaking in this video, along with several other upstarts of the same stamp, conspired to remove Srila Prabhupada as guru of ISKCON immediately after His departure from this world—or possibly even before. These unfortunate deviants poisoned the iskcon mission with the idea that Srila Prabhupada is dead and gone and no longer directly available. 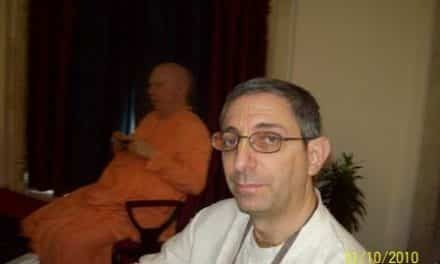 They poisoned His iskcon mission with the idea that they, a band of neophyte sadhaka preachers, had been appointed by Srila Prabhupada to take His place. When this lie was widely exposed a few years later, they adjusted their stance and said anyone could become a spiritual master or diksa-guru in iskcon without an order from Srila Prabhupada—as long as they got a rubber-stamp approval from the gbc. In this way, with the clever word jugglery of bogus pundits, they avoided total mutiny in the poisoned maya-iskcon and made a bad situation much worse. In the maya-iskcon it seems that anyone with any standing at all in the institution, even dependent women, wants to be a guru with his or her own disciples and bank accounts. This is the ultimate poisoning of the mission. Instead of learning the art of humble following in the undivided mission of Srila Prabhupada, everyone learns posturing and pretense. This is proof that gbc iskuru proponents have no faith in any of the other elected iskurus or the concocted system of guru elections they espouse. 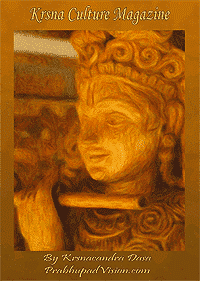 Otherwise, why do so many devotees feel compelled to become upstart iskurus themselves? There are already so many iskurus in every region and sometimes many in the same temple or town. The reason in most cases may likely be personal ambition and a lust for fame and personal distinction, which one great Vaisnava has compared to hog stool. All this false ambition has created innumerable schisms in the once united mission of Srila Prabhupada. We agree with one point in this video dialogue: that the true spiritual master must be worshiped on the same level as the Supreme Personality of Godhead. This is acknowledged in all the sastras and supported by all authorities. But the iskcon-gbc — greatly embarrassed by their own proliferation of cheap iskurus and cheap followers and the repeated gross fall downs of these people– finally banned public iskuru worship in iskcon temples, although back room or back alley worship is still allowed. The gbc now admits that they cannot vouch for the stability or level of realization of their elected iskurus. Rather, they suggest that the new student must do their job for them and ascertain for himself or herself the devotional level of his or her prospective iskuru. Thus a new student, who has no proper training or experience, is left with the tough task of wading through the muck of maya-iskcon politics to find out which iskuru, if any, is truly advanced in Krishna consciousness. Some of these poor students have had three or four iskurus who have been exposed for gross deviations or have left the mission all together. The gbc leaders, however, wash their hands of this tragedy, saying it is not their fault but is due to the student’s own bad karma. They say that these misguided bhaktas should just keep shopping around in iskcon for a truly advanced guru until they finally find one. What the above-mentioned upstarts and gbc refuse to understand or admit is that Srila Prabhupada is still fully available for anyone willing to follow Him. He is not a temporary or physical guru—He is an eternal guru, a fully spiritual sad-guru. Nor is His mercy or ability to save sincere souls limited in any way. Iskcon leaders have failed to understand that not everything the maha-bhagavata nitya-siddha shatavesha acarya does can be followed by His wannabe replacements. Rather such wannabe imitators degrade themselves and their followers by such imitation, as we have repeatedly seen in the maya-iskcon. (Not all pretenders are foolish enough to get caught red-handed in some sinful act but certainly all such imitators and their promoters are fallen souls.) Unfortunately, uneducated neophytes cannot understand the distinction between strict following and imitation, or between a liberated soul and pretenders. The iskcon gbc has constantly refused to appreciate that Srila Prabhupada’s position is unique in the Krishna consciousness movement. The level of worship He receives as Founder-Acarya is unprecedented in the history of Gaudiya Vaisnavism and will likely remain so forever. As it is said about Srila Jiva Goswami: “Never before was there such a great scholar. Never again will there be such a great scholar.” Srila Jiva Gosvami’s position as a great Vaisnava scholar is unique. Similarly, the position of Srila Prabhupada, who singlehandedly spread the mission of Krishna consciousness all over the world, is unique. Other than Lord Caitanya or Lord Nityananda, no one can take His place or assume His position. As Srila Prabhupada and the sastras have plainly stated, any so-called preacher who tries to imitate a maha-bhagavata will become degraded. This fact is an absolute. This fact has been verified repeatedly in the maya-iskcon and maya-gaudiya math branches. “This extraordinary immortality on the part of Brahma was heard to have occurred in some particular kalpa, but it could not have happened in the kalpa in which Brahma heard directly from the Lord the four essential verses of Srimad-Bhagavatam because the Lord blessed Brahma, after giving him lessons on the Bhagavatam, that he would never be bewildered in any kalpa whatsoever.” (SB. 3.12.28, Purport). The Lord Brahma who is the original guru of the Brahma Sampradaya and who spoke Sri Brahma-Samhita never fell into illusion even for a moment. The other Lord Brahma who became momentarily bewildered was not acting as a bona fide Vaisnava Acarya in the eternal sampradaya. Regarding the other great Vaisnavas mentioned, they were also not acting as Vaisnava Acaryas, but as humble sadhaka bhaktas, although in fact they are great devotees whose mission is the guidance of all conditioned souls in the material world. Nor did they truly fall down. Dhruva Maharaja was acting, apparently overzealously for the moment, in his role as a ksatriya Emperor. He was chastising the demons who killed his pure devotee brother. Bharata Maharaja was acting, momentarily, as an overly compassionate, softhearted sadhu. Arjuna was acting as an overly compassionate man of religion, just to set the stage for Lord Krishna to speak Bhagavad-gita. Fools who suggest that great devotees might one day fall down have understood little, if anything, of the actual science of Guru-tattva. They have apparently understood nothing of the exalted status of all Gaudiya Vaisnava Acaryas. They have understood little, if anything, regarding the unique position of Srila Prabhupada. Sometimes devotees argue that Lord Caitanya issued a blanket order for all devotees to initiate their own disciples. This idea was rejected by Srila Prabhupada in several statements, such as the ones above. Similarly, this idea was flatly rejected by Sri Gadadhara Pandita. When He was asked by Vallabha Bhatta (Vallabha Acarya) for initiation, Sri Gadadhara refused, saying that He had no order from Lord Caitanya to initiate His own disciples.